I’ve received a number of beautiful cookbooks over the past few weeks. In the past, I would peruse through the books for the beautiful pictures, not necessarily the recipes. I’m just horrible at following directions. I’m kind of impatient that way. It’s ironic for a person who blogs about food and recipes. But I’m trying to change that. I’m planning to cook at least one thing from each book I own. It may take a while, but I’ll get there…eventually. One of the books that I received caught my eye right away. It was a book called Gluten-Free Baking by Phil Vickery – a popular British chef. Not only are the recipes gluten-free, but most of the recipes are lower in sugar content than the American counterparts. I don’t have much of a sweet tooth, and I prefer my baked goods/desserts less sweet. So it was perfect for my palate. The first recipe I decided to try was the sweet potato cookies recipe. It was a no-brainer. I had plenty of roasted sweet potatoes in the fridge I had to use up. But more importantly, the recipe required very little added sugar due to the natural sweetness of the sweet potatoes. First, I followed the recipe as written. The recipe required that I flatten each piece of the cookie dough into very thin discs and bake for about 18-20 minutes. The flavor was good, but it was too dry. There wasn’t enough fat in the recipe for them to be baked so long. So instead of turning crispy as the book suggested, they turned dry. Back to the drawing board. In my next try, I didn’t flatten the cookie dough and baked it for about 15 minutes. Much better! But it could still have baked for a shorter amount of time. I like my cookies either chewy and soft, or crispy – one or the other, nothing in between. So I shortened the baking time even more. I baked the cookies for about 12 minutes, just until the bottoms were golden brown. Winner! I loved the texture and the taste. In short, the cookie dough is pretty flexible to adjust to different preferences. So you can adjust the thickness of the cookies and the baking time accordingly. The recipe below is how I like my cookies – especially with this type of dough. 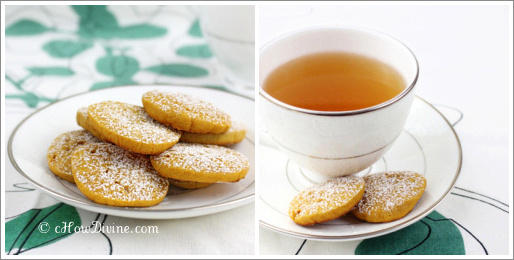 And these cookies are a great healthier alternative to your average holiday cookies. They are lower in fat and in sugar; but they still taste fabulous! I hope you enjoy these cookies as much as we did. 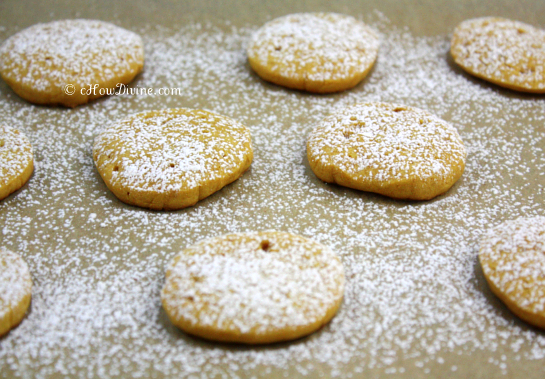 Don’t forget to sprinkle the cookies with some powdered sugar and spices. They really add to the flavor AND the holiday feel of the cookies! Preheat oven to 375 degrees. Prepare a large cookie sheet with parchment paper. Whisk together sugar, flour, baking powder, and salt in a large bowl. 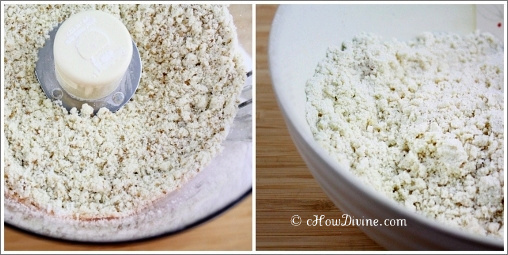 Add cubed butter or coconut oil to the bowl, and rub the mixture together until the mixture resembles bread crumbs. Alternatively, you can pulse the mixture in a food processor. Add the sweet potato and egg to the mixture. Mix well. Alternatively, pulse in a food processor until the dough comes together. Don’t over-handle the mixture (dough) as it will become stickier and harder to handle. Mold the dough into a 6-7″ cylinder. Wrap tightly with seran wrap and refrigerate for at least an hour. If you are in a rush, put it in the freezer for about 30 minutes. 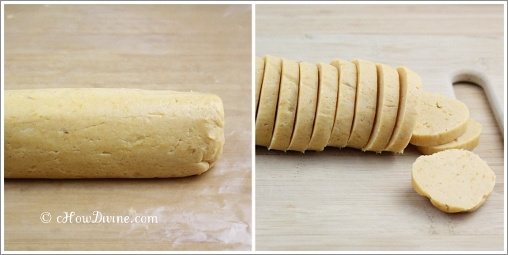 Once chilled, cut the dough into 1/4″ round pieces. Spread out the cut dough on the prepared cookie sheet. Bake in batches. Bake for about 12 minutes – until the bottom of the cookies are golden brown. Cool the cookies completely on a cooling rack. Dust with confectioner’s sugar with a pinch of cinnamon and nutmeg. Use coconut oil/butter for a dairy-free option. Make sure that the coconut oil is chilled, but not brittle or hard. Superfine sugar is recommended in the book. Although I eventually found it, I had to go to several stores. If you can’t find it, you can make superfine sugar by processing a cup of regular, granulated sugar in a food processor for about 30 seconds. Don’t over do it. I’ve made this using sucanat and brown sugar as well. Although the dough does get stickier due to the higher water content of these sugars, I preferred the flavor. If you want to use brown sugar or sucanat, I recommend dropping the dough on wax paper to mold into a log. It’s much easier to handle this way. Just stick it in the fridge for a few minutes. Once the dough is hard enough to handle, transfer the dough onto a seran wrap and wrap tightly. Refrigerate for an hour. I completely understand about following the recipe..I try but I always change them in the process:) Those cookies look fantastic, and I could eat anything with sweet potatoes…if nothing I just roast them in the oven for myself when I need a kick! Will try this over the winter break! Thanks for sharing and have a wonderful Holidays!!! I wish I saw this earlier today. I just tried making some sweet potato cookies according to a foodnetwork recipe (and they did not specify canned!) Fail! I need to try this one. Hi Kelsey! Baking with sweet potatoes can be a bit tough because of its high water content. I roast mine; but if you are planning to use canned sweet potatoes, make sure that it isn’t too watery. If it has residual moisture, you can dab it off. I hope you are having a wonder holiday season! Thank you so much Marla! 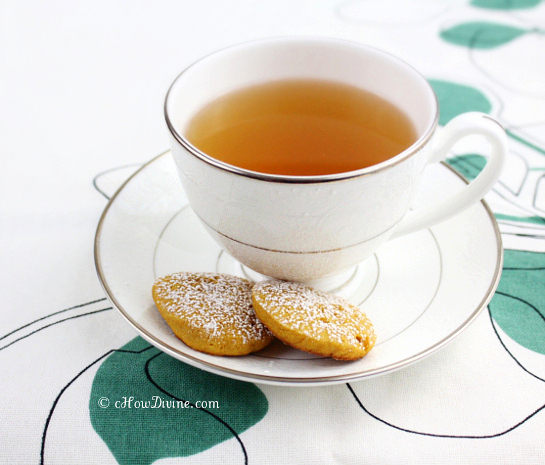 These cookies provided a much needed healthier alternative for us over the holidays. I love sweet potatoes (Japanese or reg kind)! I have a close friend who’s daughter eats GF food. I think she would love to bake these cookies (and maybe I can visit? ;)) so I’m going to send this link to her. Very healthy cookies! I LOVE Japanese yams. I think they are the same as the Korean gogooma (Korean sweet potato). I really can eat those everyday. I’m sure your friend won’t mind at all if you visit; because I’m sure you’ll bring a goodie or two of your own. 🙂 I hope she likes these. Happy New Year to you and your loved ones!